Jamie says: So truth be told, I love the number 23. It’s my favorite number. I thought this was interesting because I really didn’t have a reason to love the number 23 (it’s not my birthday number or anything), but I liked it regardless. I get excited when it’s the 23rd of any month, too. Then, recently, I discovered my Baptism date- November 23rd. Answer delivered. I can now say I have a connection with the number 23 because it’s my birthday with the Catholic church. Done. This year was the first year that I celebrated my Catholic birthday (since my actual Baptism in 1986). Hey, it’s a birthday and it’s a big deal. So why not celebrate it and everything worth celebrating. Makes me think of those Carvel commercials (you know, “I lost my tooth today, started my school play”… so catchy. Carvel cake to celebrate everything.) So to celebrate my Catholic birthday, I had a Taco Bar Party with Mole Pork Tacos, Saffron Rice and Beans, and Sangria and invited my friends over. Then came the mixing of the fruit and the wine- plus some (might I add, very good) bourbon. Then off to the refrigerator it went until party time. 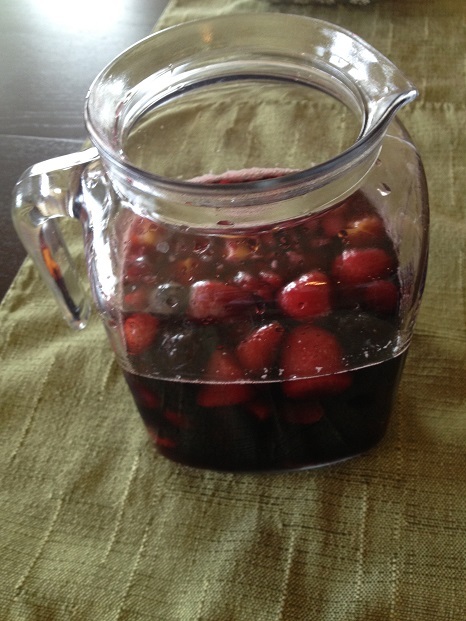 Right before the company came, I added a the club soda and tossed in a wooden spoon to scoop out the fruit with. 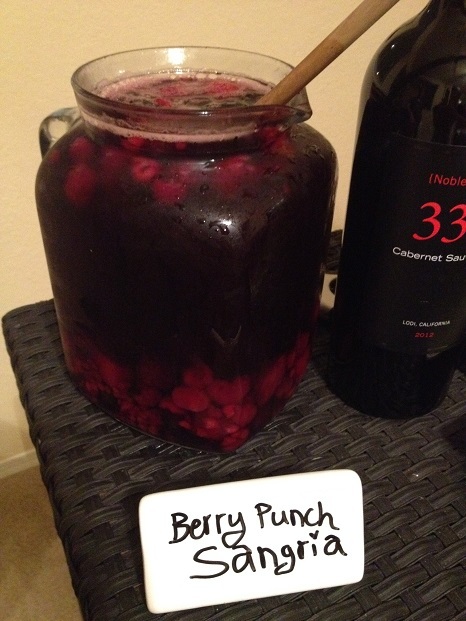 And there you have it, Berry Punch Sangria. Ok, so what’s next you ask? I had cocoa-dusted almonds, popcorn, black bean chips (salsa came later from a friend), and maple bacon chocolate. 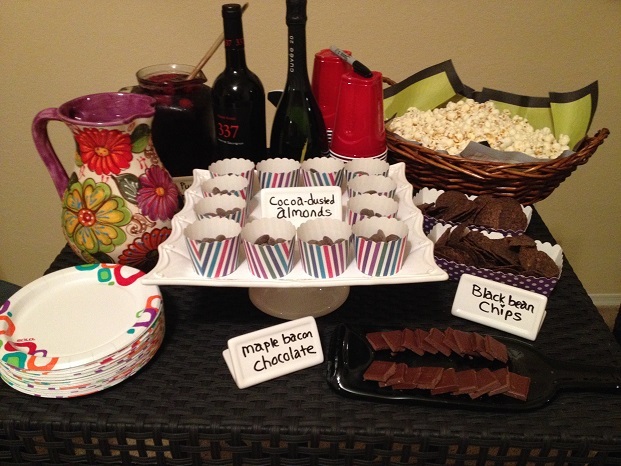 I had fun setting up the appetizer table and using some cool hostess accessories from friends for my birthday. And then then, the main course- a taco bar with mole pork, whole grain tortillas, and about 16 toppings. I served the bell peppers and onions fajita style in an electric wok. And what do you get when you put it all together! 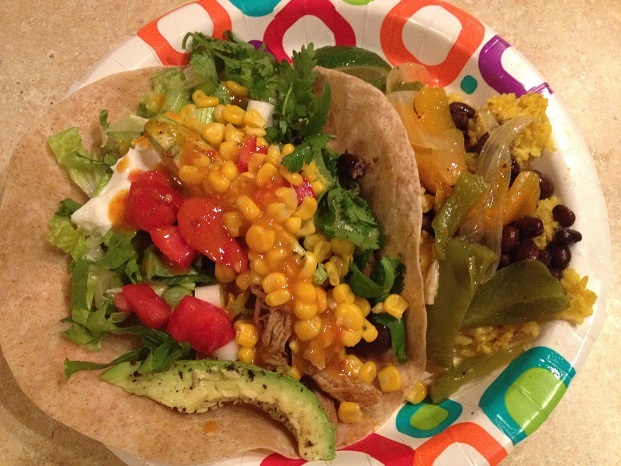 A tasty, stuffed taco with a side of saffron rice and beans. Oh, and a happy tummy and good times with friends. There were definitely leftovers to be had. 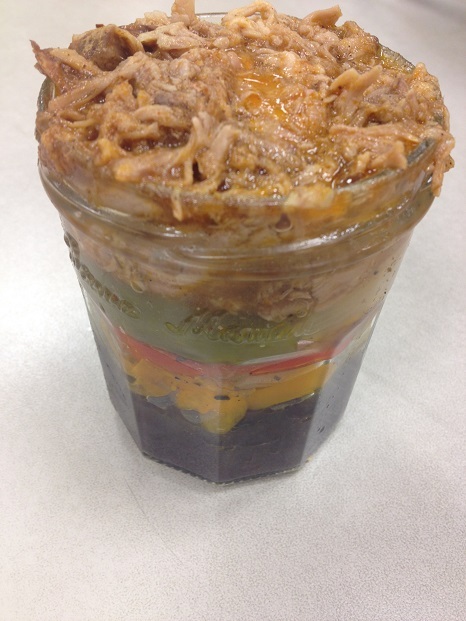 I packaged a jar up for work to heat in the microwave- a layer of beans, followed by fajita peppers and onions, and topped with mole pork. Yum! Place Boston but in a slow cooker (Crock Pot) on low heat for 3 hours. Increase heat to high and heat an additional 2 hours. Shred pork using a fork. Add mole sauce and mix in. Enjoy (on tacos)! Preheat oven to 325°F. Pour rice and water in a large baking dish. Add saffron. Stir. Bake for about 1 hour and 20 minutes. 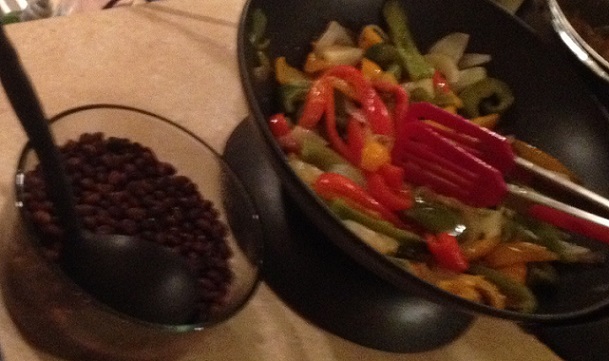 Enjoy (with black beans)! Slice onions and peppers. Place in an electric wok on medium-low heat with olive oil, salt, and pepper. Stir occasionally and place lid on in between. Cook for about 15 minutes or until soft. Reduce heat to low until ready to serve. 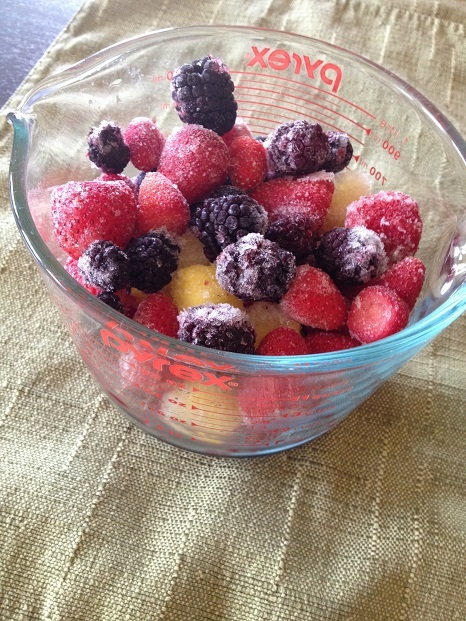 Place frozen fruit in a large pitcher. Pour wine and bourbon on top. Mix with a spoon. Refrigerate. Before serving add club soda and stir. Those 21 and over, enjoy! 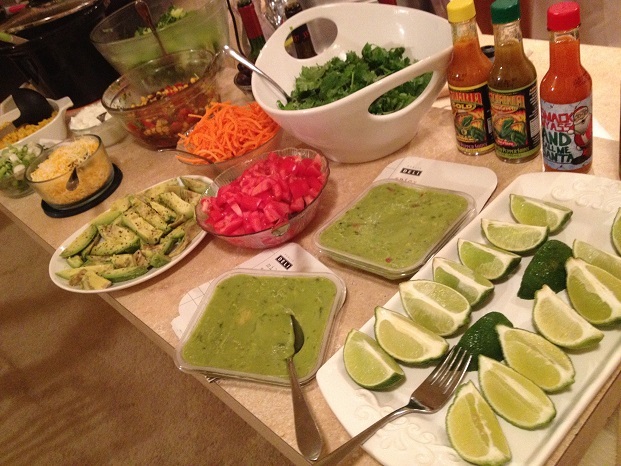 Nutrition note: A taco bar party can be great for a group where there may be different food preferences/intolerances. Everyone can make their own meal according to what they desire to or can have. 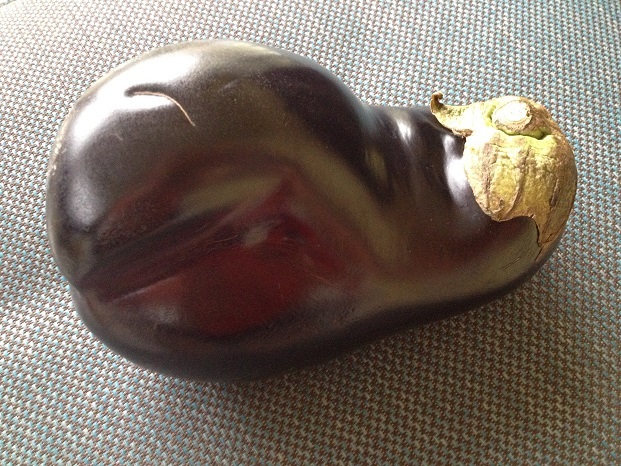 And so what did I do with my eggplant? I made Baked Eggplant Parmesan. 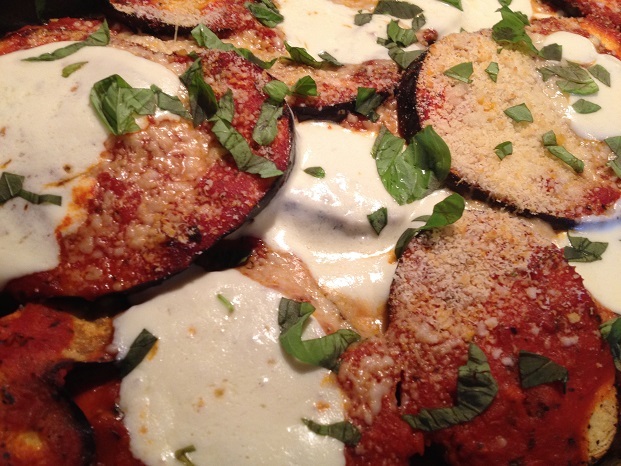 And not just any eggplant Parmesan, but my best eggplant Parmesan yet! One that I had to show a picture of to my Italian Grandmother. I think the key to a great eggplant was a good sauce, light olive oil, fresh mozzarella, and fresh snips of basil. 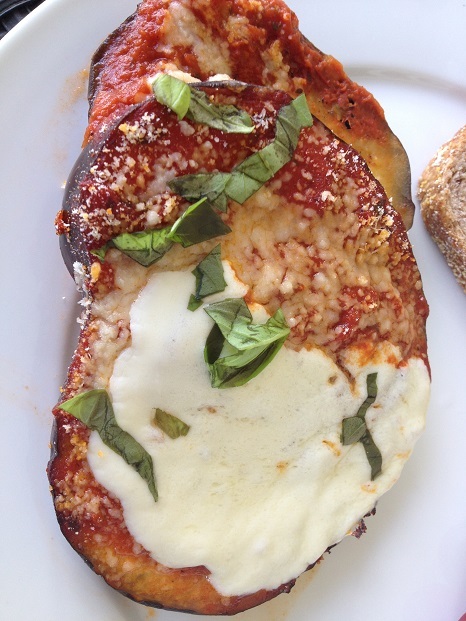 Lightened up eggplant that’s delish! It went perfectly between two slices of whole wheat bread to make an eggplant parm sandwich. I froze the leftovers and brought them to work. What a treat to have during the work day. Fit for a king. Perfect for a sandwich. Preheat oven to 375°F. Slice eggplant into disks. 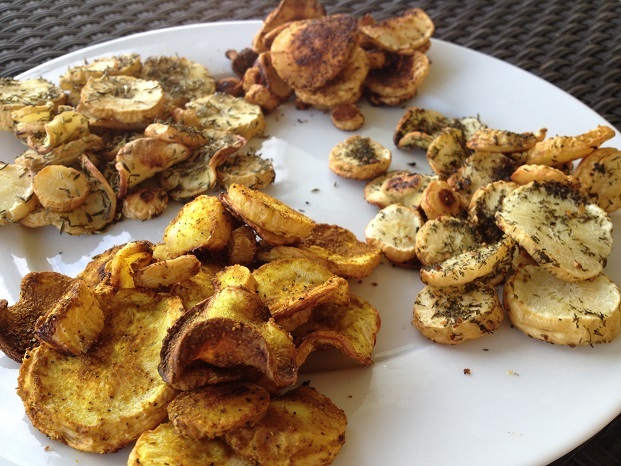 Spray both sides of sliced eggplant with spray extra virgin olive oil and top with freshly ground pepper. Place slices in one layer on a baking dish and pour half of sauce on top. Spread sauce evenly. Use remaining eggplant to a second layer and pour remaining sauce on top. Bake for 30 minutes. Slice mozzarella. 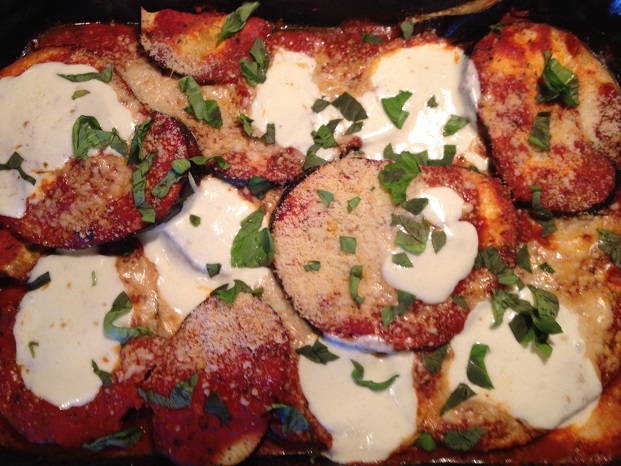 Sprinkle baked eggplant with Parmesan cheese and distribute pieces of sliced mozzarella evenly on top. Heat an additional 5 minutes or until cheese is hot and melted. Remove eggplant from oven. Use kitchen sheers to cut fresh basil over cooked eggplant. Enjoy! 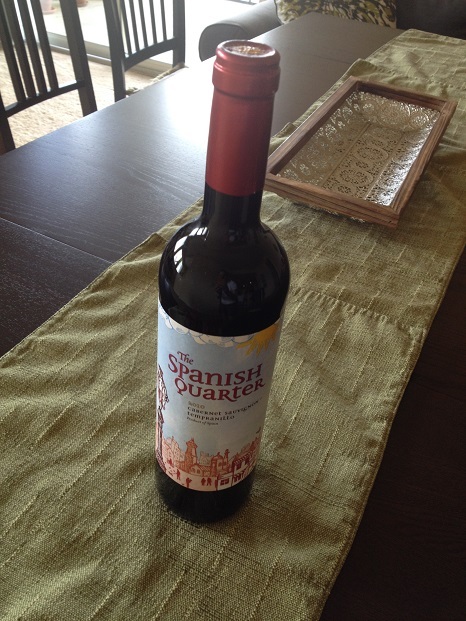 Serving suggestion: Serve with whole wheat bread to make eggplant Parmesan sandwiches. Nutrition note: Make baked eggplant instead of fried eggplant to reduce the calories while maintaining the delicious flavor. Using spray olive oil and a single layer of cheese helps reduce the calories even further. No sacrifice in taste here. Jamie says: What a beautiful holiday Thanksgiving truly is. Each year I grow to appreciate it more and more. I guess you could say it’s a holiday I have a growing relationship with. And I’m not just talking about Thanksgiving dinner. For our Italian family, Thanksgiving goes beyond the dinner table. It’s the turkey bread baking with cousins at Grandma’s house the day before. It’s watching the Macy’s Thanksgiving Day Parade until Santa crosses the finish line and using our Christmas Spode for breakfast. It’s 6 hours after Thanksgiving dinner when my family (Grandma, Aunts, Uncles, cousins…) are laying down talking about life and half-falling asleep. It’s going to the movies and gathering for the leftovers the next day. It’s Aunt Lavinia’s family auction where we all bring our give-aways and Aunt Lavin auctions them off one by one. That is Thanksgiving, my friends. And I wouldn’t change it for the world. I was reflecting on my family’s front porch about the many blessings in my life which I am so thankful for (including delicious food). It’s super easy to make and looks oh-so-festive. The orange color is super fun. Plus, how often do we eat a vegetable for breakfast? I love milk in my oatmeal. If you do, too, add a splash. 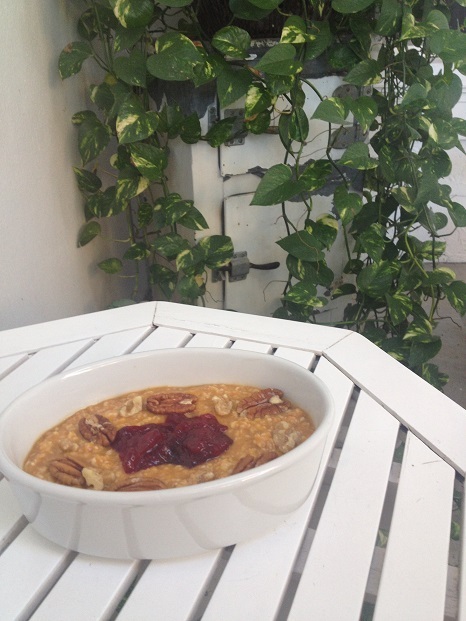 And enjoy your quick, holiday breakfast. 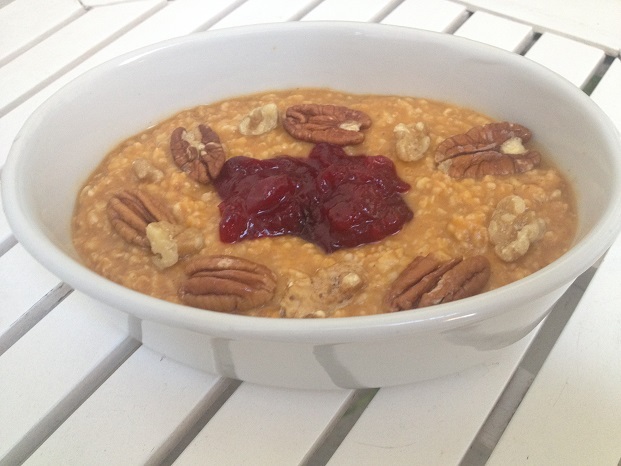 Combine oats and water in a microwave-safe bowl and cook for 1 minute in the microwave. Stir, add pumpkin and apple pie spice, stir, and heat for an additional minute in the microwave. Scoop cranberry sauce in the center. Place walnut halves and pecan pieces on top. 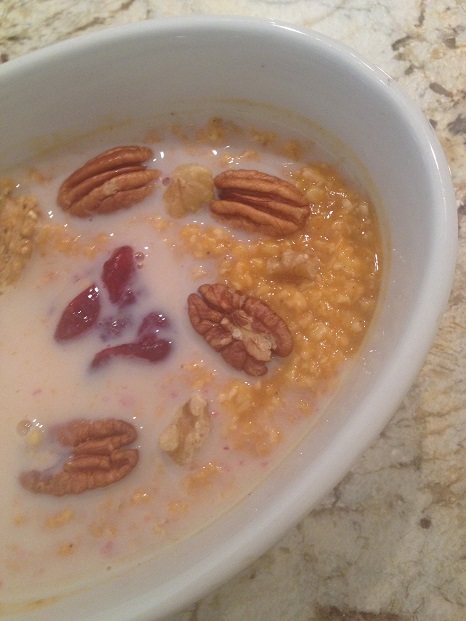 If desired, top with a splash of fat free milk. Enjoy! Nutrition note: Enjoy holiday flavors (such as pumpkin) throughout the season and in lighter recipes to prevent overeating at holiday events. 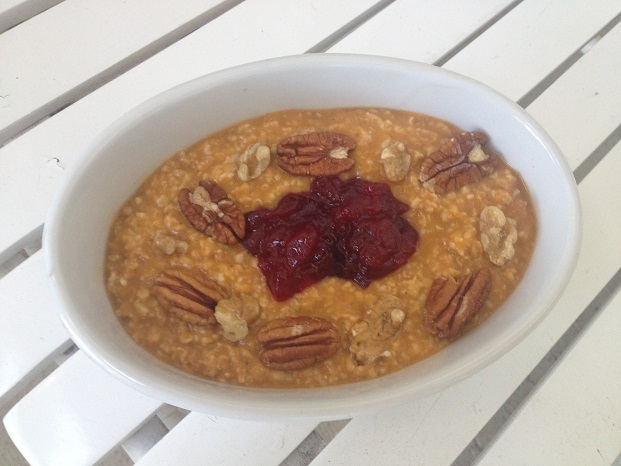 By having some pumpkin oats, you may feel more satisfied and less likely to eat as much pumpkin pie. Jamie says: “Variety is the spice of life,” so why not get a little adventurous and creative with the herbs- and spices- in your pantry? 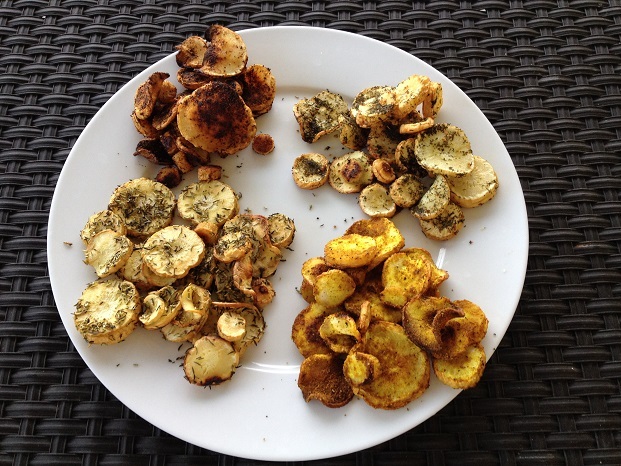 Let’s be real, unless you’re feeding a family, it can get a little boring to eat four servings of the same parsnips- so why not make a Parsnip Sampler and jazz each serving up with a burst of different seasonings. Curry, and dill, and chili, and rosemary, oh my! Preheat oven to 375°F. Wash parsnips. Cut off and discard ends. 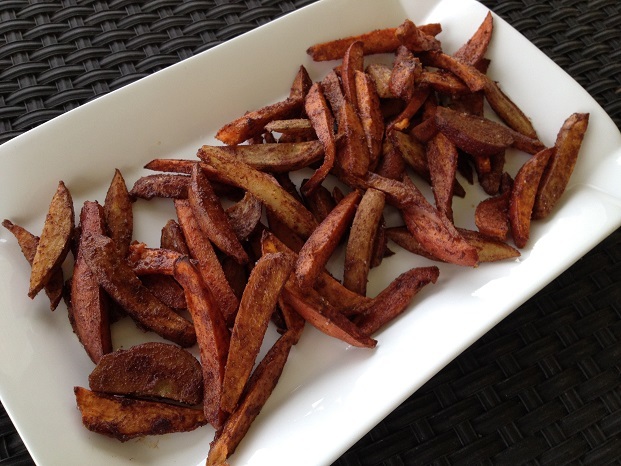 Cut parsnips into slices about 1/2 inch thick. Cut large slices (from the top part of the parsnip) in half to make half circles. Place cut pieces in a pile on a large baking sheet. Drizzle olive oil on top and mix in with clean hands. 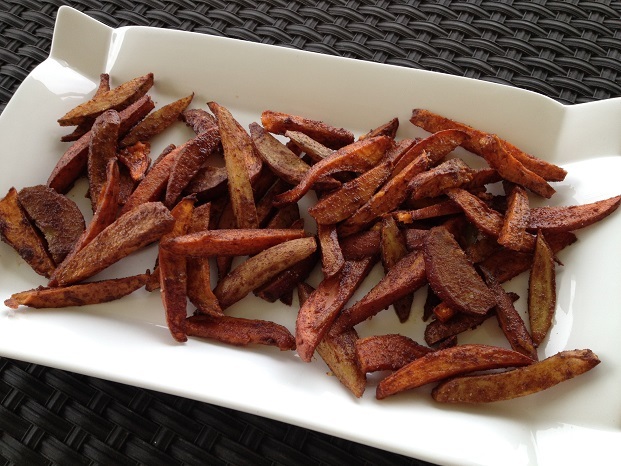 Put one-fourth of the parsnips in the corner of the baking pan and sprinkle with chili and cumin. Mix well. Add salt on top of the remaining three-fourths. Mix well. 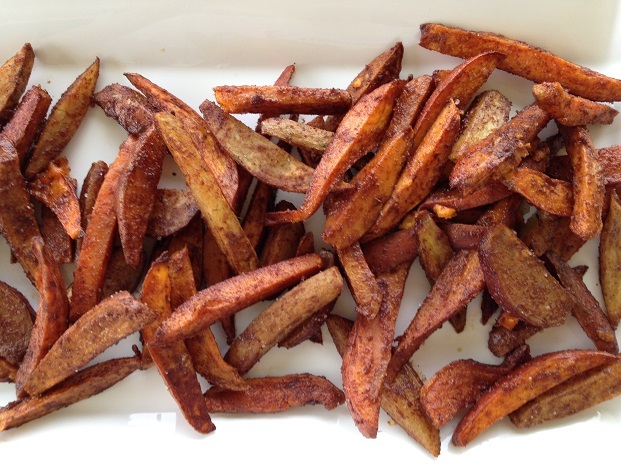 Divide salted parnsips into three separate piles in the remaining corners of the baking pan. To one pile, add dill and lemon peel; to the third, add thyme and rosemary; and to the fourth, add curry. Mix each pile separately with clean hands and spread out so pieces are not piled. Roast for 30 minutes or until soft when pierced with a fork and golden brown. Serve each variety separately. Enjoy! Nutrition note: Parsnips are a good source of vitamin C, folate, and fiber. They also provide carbohydrates for energy. Jamie says: I did it! I made chia pudding. And it was epic. Well, maybe epic is a little strong of a word, but it was delicious and epic for the moment. It tasted much like traditional pudding, but more filling and, to me, even better. So satisfied. 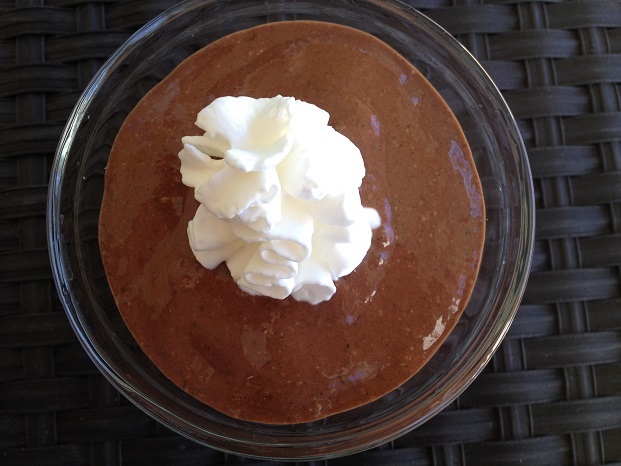 Just like “real” pudding- but even better! Ready to dig in? Give it a try. In a mini blender (i.e. 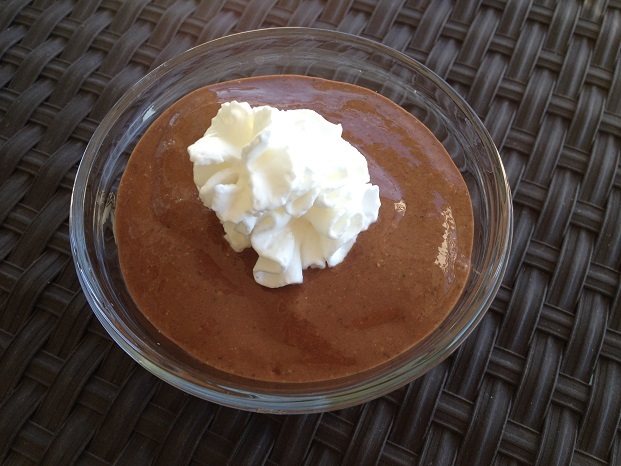 Bullet-style), add chia gel, milk, protein powder and unsweetened cocoa. Blend until all ingredients are incorporated. Serve in a small bowl with whipped cream on top. Enjoy! 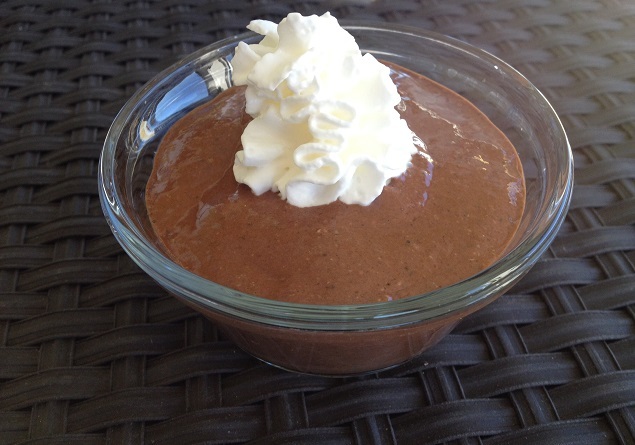 Nutrition note: This pudding has more protein and omega 3s and less saturated fat and sugar than your traditional pudding. Jamie says: Wow, it’s cold! This South Florida girl is not used to this arctic-like weather. Gets me every time. (I’m in Florida by the way.) Call me crazy, but for some reason, I like frozen yogurt when it gets cold out. (Is anyone else the same way?) And so, I woke up freezing, and what did I want for breakfast? 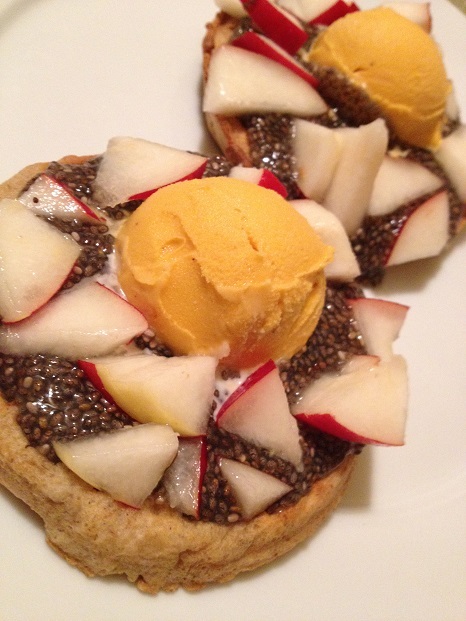 Frozen yogurt…and chia gel. (Told ya I’m obsessed with this chia gel stuff.) 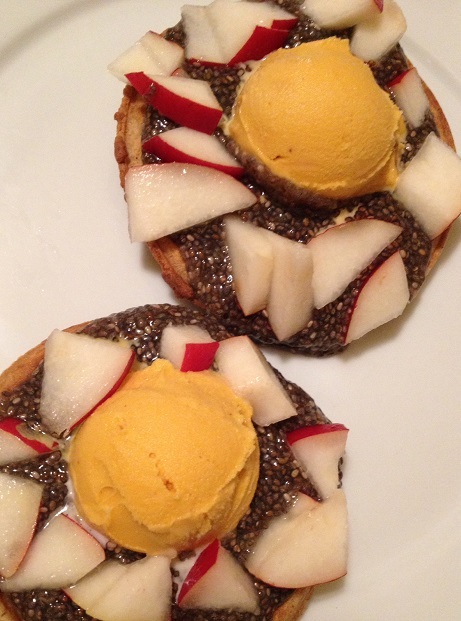 I put the two together and made Pumpkin Fro Yo ‘n’ Pear Chia Sunrise Waffles! They look so pretty! Like flowers or a sun with rays. Heat waffles in toaster until they’re golden brown. Chop a pear. 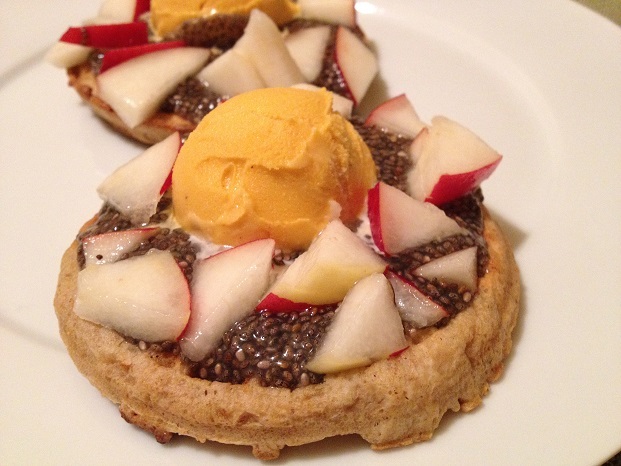 Spread chia gel on toasted waffles. Place a 1/4 cup scoop of frozen yogurt in the center of each waffle. Divide chopped pear on top of both waffles, around the frozen yogurt scoops. Enjoy! Nutrition note: Recipe makeover- Make waffles and ice cream healthier by using whole grain waffles and a portion-controlled amount of fat free frozen yogurt; top with fresh fruit fruit for fiber and vitamins; chia gel adds fiber, omega 3s, and calcium.